Treasury yields initially dipped after the weaker-than-expected payrolls data, but these have now reversed. ADP June U.S. private sector jobs total increased by 158,000. The benchmark 10-year yield has hit its highest level since May 12, rising 4 basis points. The 30-year yield has hit a more-than one-month high of 2.895 percent. Three of the world's biggest energy companies have reportedly pushed Qatar to expand its gas production by 30 percent. According to Reuters, the CEOs of ExxonMobil, Shell and Total have met with the Qatari Emir in Doha, lobbying for an increase in output of liquified natural gas. 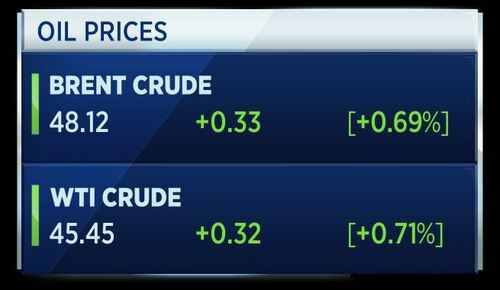 Oil prices are up today. Meanwhile, the war of words between Qatar and its neighbours continues. Four Arab countries are expressing disappointment at Qatar's "negative" response to their demands. But they declined to put new sanctions in place. The details of the response from Qatar haven't been made public. CNBC's anchors are discussing the viability of electric vehicles compared to hybrid and combustion engines. Steve Sedwick had this to say. How far do you think it can go on its electric engine? I’ve heard in real world tests twenty miles. Twenty miles! That gets me to the M25, if I’m lucky. Let’s just park aside the fact that these electric engines are pretty pony at the moment anyway and I’ve had this out with the boss of Ford, I’ve had this out with other bosses on this channel, the fact is these engines aren’t there. Apart from Tesla, no one has the range at the moment. President Trump arrived in Poland yesterday ahead of the G-20 meeting in Hamburg. Poland's President Duda says Trump's visit to Warsaw strengthens Poland's position in the EU. Facebook, Twitter and Snap are said to be seeking permission from Fox to show clips from this year's football World Cut, accoring to a Bloomberg reporting citing sources. The social media platforms are reports to have offered Fox tens of millions of dollars for the rights to highlights from the Russia-hosted games that air in the U.S. The Bank of France’s Governor François Villeroy de Galhau says the country should see growth of about 1.6 percent this year. He says France could cut the unemployment rate to about 7 percent with ambitious reforms. German May industrial orders grew 1 percent month on month, according to the economy ministry. This was under expectations of 2 percent growth. Consumer goods orders were down 2.9 percent month on month. April's industrial order was revised to -2.2 percent from -2.1 percent. The economy ministry says a solid development in orders and an excellent business climate suggest a continued upturn in manufacturing. 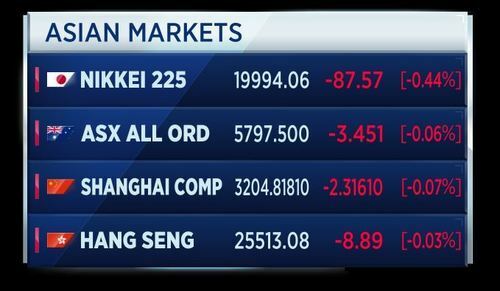 Asian shares dropped following the release of the Fed minutes. The central bank minutes revealed a lack of consensus on the future pace of U.S. interest rate increases, creating some uncertainty. It also led to the dollar weakening against the yen, which has weighed on the Nikkei. German Chancellor Angela Merkel says she expects there to be "difficult discussions" at the G20 summit that kicks off in Hamburg Friday. This, as the city prepares for thousands of protesters, demonstrating for a range of causes, with much of the tension involving President Donald Trump. Meanwhile, Germany Foreign Minister Sigmar Gabriel says he's worried President Donald Trump could "start a trade war with Europe." Gabriel made the comments to German radio, just ahead of the President's arrival in Hamburg. Trump's European trip will include talks on trade and infrastructure. The talks come as Trump looks to push through a trillion dollar plan in America, aimed at revamping the ageing transportation network there. 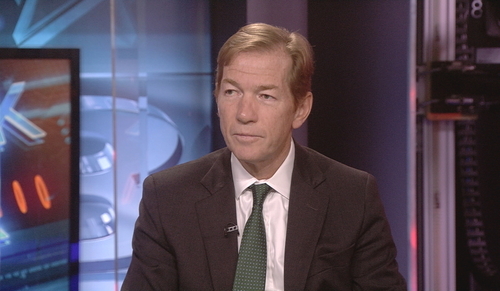 Doug Peterson, president and CEO of S&P Global, says there will be an infrastructure investment plan in the U.S., but doesn’t think it will end up being what’s currently proposed by the Trump Administration. The real need in the United States to fill the infrastructure gap is to get more private sector funding into the economy. There is a lot of funding on the sideline coming from the private sector: it’s pension funds, it’s nurses, it’s teachers, it’s policemen, it’s firemen who have their pension systems. That money starts going into long term infrastructure that matches their needs in the long-run for their retirement programmes. A cautious open is called for European markets. The FTSE and DAX futures are marginally higher, while the French CAC is called flat. Cloetta announces it is to divest its Italian operations. The sale equals an enterprise value of around 450 million Swedish krona. The proceeds will generate a positive net cash effect of around 415 million krona. The divestment will result in an impairment estimated to be cost around 365 million krona before tax, which will be reported in Q2. The transaction is not subjected to regulatory approvals and is expected to close in Q3 of 2017. A magnitude 6.0 earthquake has struck 7 km east of Lincoln, Montana in the U.S. It occurred at a depth of 10.0 km, according to Reuters citing PTWC. The U.S. Federal Reserve members were split on the inflation outlook and concerned about how long the unemployment rate can stay under 4.7 percent. That's according to minutes from the FOMC's June meeting. There was also spirited discussion on when to unwind the Fed's $4.5 trillion balance sheet. The minutes did not include a timeline on putting the Fed's plan into effect. 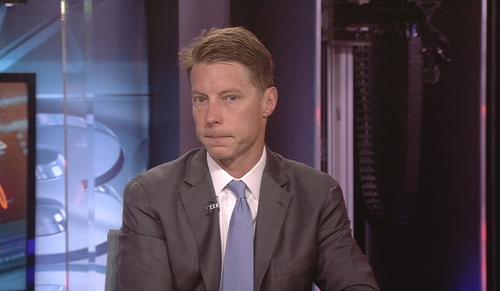 Scott Thiel, deputy chief investment officer of fixed income at Blackrock, says there was a robust discussion at the Fed about when to withdraw stimulus. Our base case scenario still is they announce in September to begin in December and although there seems to be a discussion at the board, there doesn’t seem to be much of a change in that view. So what that means for investors is they have to think about how to invest in an environment where the Fed will begin to effectively step back. The consensus would still suggest September for December. 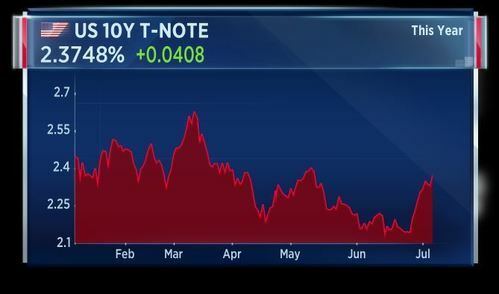 Benchmark U.S. 10 year Treasury yields popped above a 7-week high, following the Fed minutes release. The peak comes in a period of elevated yield levels, amid views that global central bank policy is becoming increasingly hawkish. The yield is currently around 2.3356 percent. Hungary's preliminary reading of May's industry output growth is 8.8 percent year-on-year, versus a fall of 3 percent year-on-year the previous month. A choppy start to Thursday's session. The DAX, FTSE MIB and Spanish IBEX are positive, while other markets are flat or negative. Here are some key stocks to watch today and how their shares are performing. Click or tap on the arrows to switch charts. Reckitt Benckiser has downgraded its revenue guidance after a global cyber attack hurt the manufacturing and distribution of its products in several markets. The British consumer goods company has predicted a 2 percent drop in second quarter like-for-like revenue. It also revised down its growth forecast for the full year from 3 percent to 2 percent. Shares are down 2 percent. Sodexo has trimmed its full-year sales growth goal to a range of 1.5 to 2 percent, down from an original forecast of 2.5 percent. Weaker activity in health care and universities in North America weighed on results. The catering services company said its full-year operating profit growth would come in at the low end of its range, between 8 to 9 percent. Shares are down 4 percent. Bovis has booked an additional £3.5 million provision to fix problems in its newly built homes. The British housebuilder, which is undergoing a turnaround, warned that first half profitability has been impacted by higher build costs. But it added that results were in line with expectations. Bovis says it has slowed production this year and expects completion volumes to be around 10 to 15 percent below 2016 levels. The shares are broadly flat. Associated British Foods, parent company of fashion retailer Primark, has revised its full year outlook higher. It took the step after posting a 13 percent jump in third quarter revenues for the group - but Primark sales grew 15 percent. It now expects operating profit margin at the discount retailer to remain stable rather than decline. The company says it's benefiting from sterling weakness, but warned that currency tailwinds are likely to diminish in coming quarters. The shares are up nearly 4 percent. The Bank of France Governor Villeroy says complying with the public deficit target of 3 percent of GDP is crucial if only to ensure France's credibility in Europe, according to Reuters. He adds that the country faces sovereign debt shock and competition risks if it can't repair its finances. He says increasing social security contributions is not the answer, but certain tax cuts should be deferred if not financed. He adds that Macron's planned saving of 60 billion euros are a minimum. U.K. foreign minister Boris Johnson says North Korea's actions are reckless and illegal. He told BBC radio that it is important the world stands together against its actions. He adds that China must go further on dealing with North Korea. The Swiss consumer price index dropped 0.1 percent month-on-month in June versus a forecast of no change. Year on year the index is up 0.2 percent against a forecast of 0.3 percent. China's foreign ministry says it calls on all sides to remain calm and exercise restraint over North Korea. The ministry says China is fully implementing UN sanctions on North Korea, Reuters reports. Rick Lacaille, global chief investment officer at State Street Global Advisors, is discussing trends in investing and inflows are high despite valuations. What are companies doing? They’re delivering pretty good results. There’s relatively low correlation between sectors and individual companies which is a pretty benign environment for stock picking. The reason people are putting money in is not desperation. 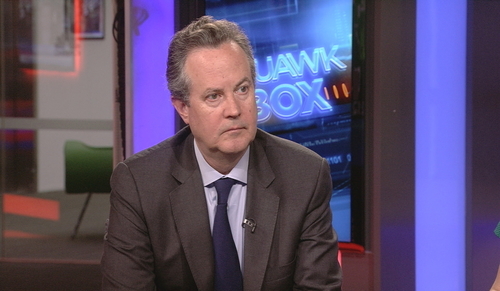 It’s not that there’s fleeing from very low yield in fixed income. I think they’re looking at growth, they’re looking at what companies are able to deliver and they’re seeing, at least at the moment, there’s not a catalyst for a sharp change in economic fortunes. Recessions are always hard to predict, but we’re not nearing the end of the cycle in a very visible way. 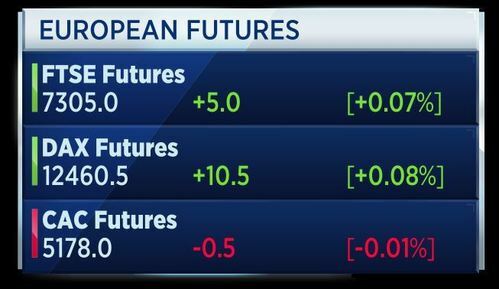 European markets trading lower, as the latest Fed minutes show debate over inflation's impact and shrinking the balance sheet. The owner of Primark looks like it's dressed for success. AB Foods rockets to the top of the Stoxx 600, as it says its outlook has improved, thanks to strong performance in its clothing chain, and a lower sterling. Damaged goods! Reckitt Benckiser shares take a hit, as it lowers its growth forecast, citing disruption from a recent cyber attack. Investors show Sodexo little hospitality. Shares in the French catering company fall after it lowers its sales guidance, as under performance in its U.S. healthcare and university business weighs on the third quarter. The U.K. Financial Conduct Authority's CEO Andrew Bailey sales restricting financial services trade after Brexit is not inevitable. He says authorities should not dictate the location of financial firms after Brexit. He says U.K.-EU co-ordination is needed to keep financial markets open after Brexit. This co-operation could be based on comparability, rather than exactly mirroring financial rules. Bailey says this as several financial firms announce their plans for the future. Some have announced their intention to closing or reducing their London offices and open subsidiaries within the EU. Deutsche Bank was reported on Wednesday to be preparting to move large parts of its business in London to its hometown of Frankfurt. Swedish home prices rose 4 percent in the period April to June, according to the country's stats office. 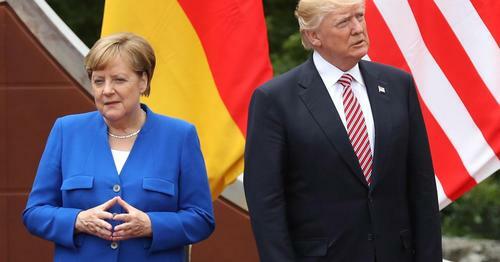 With President Donald Trump due to arrive in Germany later on Thursday, a lawmaker in the country has voiced concerns over a potential trade war between the U.S. and Europe as a result of Trump's protectionist policies. The U.K. Financial Conduct Authority's CEO Andrew Bailey says he hopes EU proposals on euro clearing will lead to a sensible and pragmactic implementation. He says financial firms will need a transition period after Brexit in order to continue with current trading arrangements. A spokeswomen for Russia's foreign ministry says the U.S. State Department allegations of forced labour camps in Russia using North Korean workers is "fake news." The ministry says the U.S. is trying to frustrate cooperation between Russia and North Korea. The spokeswoman adds that the use of North Korean workers in Russia is legal and does not violate any U.N. resolutions. 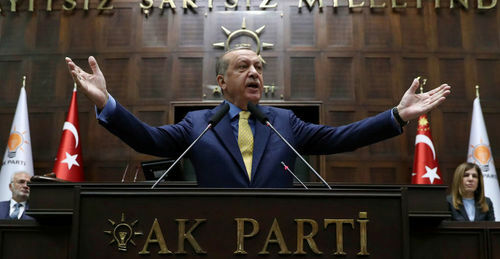 Turkish President Tayyip Erdogan is reiterating his support for Qatar, saying the demands against the isolated state are unacceptable. Speaking to France 24, he said he would only close Turkey's military base in Doha if Qatar wants it to. Mercedes-Benz reports passenger car sales are up 4.3 percent in Europe, 28.3 percent in China and 1.8 percent in the U.S. The company says June global car sales for the group are up 10 percent on the year to 221,874 units. 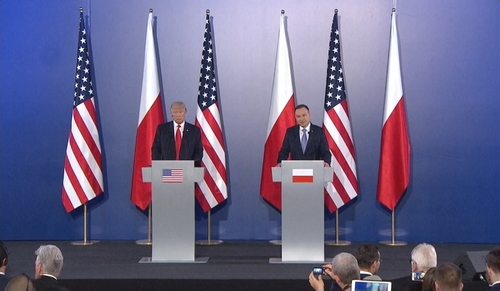 Polish President Duda is speaking alongside President Trump. He says he and Trump have spoken about defence and other issues. He says Trump is thinking seriously about Poland's security. Trump calls on all nations to confront North Korea and publicly demonstrate to North Korea that there are consequences for its "very, very bad behaviour". Trump says we will confront the threat from North Korea very strongly. Trump says he hopes many more shipments of LNG will come to Poland. The first was shipped in June. Trump hopes maybe the U.S. can get the price for the gas up, saying Duda is a tough negotiator. Polish President Duda says after the conclusion of negotiations there will be a long-term arrangement for LNG gas shipments from the U.S.
Duda says Poland could become a hub for channelling gas to the rest of Europe. He says the future is very "rosy and bright" on this topic. Trump says the U.S. will continue to work with Poland and keep troops there, but they did not discuss any guarantees on that. President Trump says it could have been a lot of other people, not just Russia, interfered with the election. He says election interference has been going on for some time. 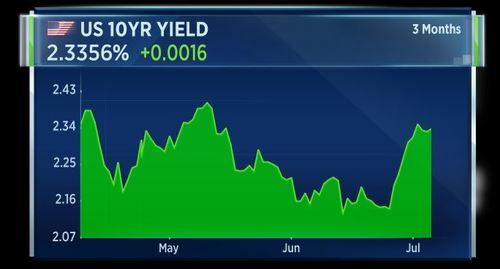 With German bund yields testing resistance, Steven Major at HSBC says the yields is beginning to reflect anticipation of an extremely gradual reduction in ECB policy accommodation. Complacent long positions have been shaken out of the Bund market following what appears to be a change in central bank focus. Valuations were in any case rich, regardless of recent disinflation. We see this as the start of the move towards our year-end target of 90 basis points for 10-year Bunds and present related trades. 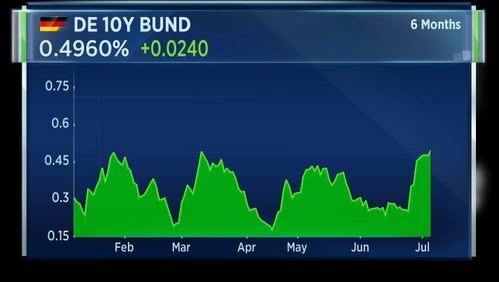 The German bund yield is close to the 50 basis point resistance level today. 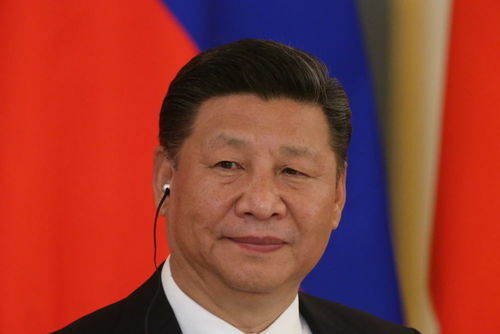 Chinese President Xi says China is committed to the de-nuclearisation of the Korean Peninsula. He says the issue must be settled through dialogue. That's according to Reuters citing Xinhua. Earlier this morning, it was reported that Xi told the South Korean president that China supports South Korea's efforts to resume talks with North Korea. He urges South Korea to clear obstacles to bilateral ties and handle relevant issues properly. President Trump is now making a speech. He says the U.S. is proud to help with the energy requirements of the three-seas nations. He says the U.S. will never use energy to coerce countries. He says the U.S. is committed to open and fair trade. President Trump is making a speech participating in the three seas summit. He says the U.S. has become a great exporter of energy and he hopes nations will make use of this. He says the U.S. will be the strongest ally and partner to the nations at the summit. EU antitrust regulators are charging Merck, Sigma-Aldrich, General Electric and Canon for providing misleading information during their merger deals. They say Merck and Sigma-Aldrich failed to tell regulators about an innovation project involving chemicals. General Electric is said to have failed to provide information on R&D activities related to the LM Wind Power deal. Finally, Canon is accused of acquiring Toshiba Medical Systems before securing regulatory approval for the deal. Merck, Sigma-Aldrich, General Electric and Canon have been accused of providing misleading information during their merger deals. The EU Competition commission can fine companies up to 1 percent of global revenue for misleading regulators and 10 percent of global revenue for implementing deals prior to registration with regulators. The EU is opening a probe into Canon's acquisition of Toshiba Medical Systems before notifying regulators. The EU says the investigation wont have an impact on the regulators previous decision to clear the three deals. A man set off a bomb in Manchester Arena on 22 May 2017, killing himself and 22 others, after a concert by Ariana Grande.